KINGSTON, Ont. 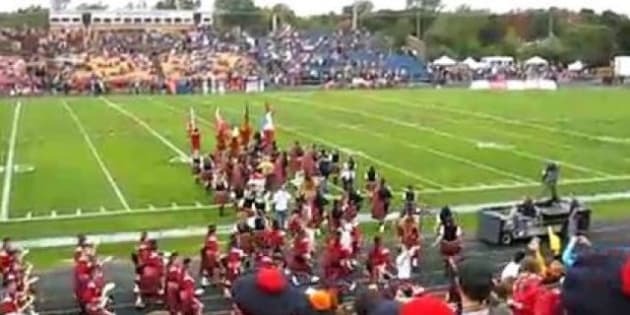 - A eastern Ontario university has suspended its marching band from participating in any of its scheduled performances for the rest of the fall term. Queen's University in Kingston says material circulated within the Queen's Bands contained offensive language demeaning to women. The material involved included guidebooks and other information circulated within the band. In addition to withdrawing from their scheduled performances, the university says Bands members must attend human rights training. They will also develop a plan outlining the steps the executive will take to review, revise and rectify Bands policies and practices. The Queen's Bands was established in 1905, and is touted as one of the largest university marching bands in Canada. The Bands is partially funded through student fees, university officials said Thursday in announcing the suspension. "The materials, and the behaviours they promote, are unacceptable," said Ann Tierney, the university's dean of student affairs. "They point to a sub-culture within the Bands where explicit, disrespectful and degrading language marginalizes community members who may remain silent for fear of exclusion," Tierney said.